Identity Circles - Icebreakers, Icebreaker Ideas, Games, Activities! Identity Circles (also known as Identity Cards or Value Circles) is a deeper get-to-know-you game, during which you will have an opportunity to discuss with many friends the values that make up your identity and how you prioritize them in your life. For this activity, you will be paired up with several different people, the number depending on how many people are in your group. The activity works best in even numbers, as pairing requires. To begin, divide your group in half and create two concentric circles (one inner circle and one outer circle). The people in the outer circle should face inside, and the people in the inner circle should face outside. Each inner circle person will pair up with an outer circle person. You can stand, sit on the floor, or use chairs for this activity; whatever is most convenient. This game works best indoors. Purchase several index cards, enough for each participant to have ten index cards (for example, if you have sixteen players, you need at least 160 cards). Also purchase pens so that each participant has one to use. Once everyone has their values written down, have the participants share with their first partner why they chose to write down the values they did. After sharing for 5-7 minutes, ask all participants to rip up one of their cards. This part of the activity gives participants an opportunity to reflect on how they prioritize their values. Ripping up the card should help the participant imagine living without that part of their identity. After the participants rip up one card, the outer circle will rotate one partner to the right. Everyone should have a new partner now. Have the new pairs discuss why they ripped up the card they ripped up. Continue this process until all participants are each left with one card — their most important value. Optional instructions: Have each person create values cards and try to order them from most important to least important. Have each person share these values with each other and explain each one, without destroying the cards. This is a very easy, low-maintenance group activity that requires little preparation and can work for as small as 8 people to as large as 50 people. This activity is also good to help encourage people to share deeply with others with whom they would not otherwise share. 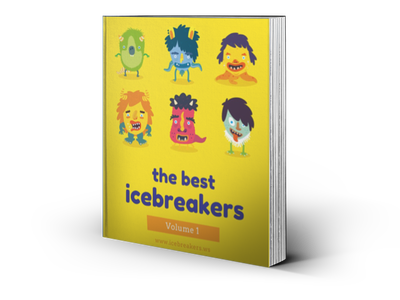 Interview Game - Icebreakers,Ideas, Games, Activities! Name Aerobics - Icebreakers,Ideas, Games, Activities! Memorable Catchy Names - Icebreakers,Ideas, Games, Activities!